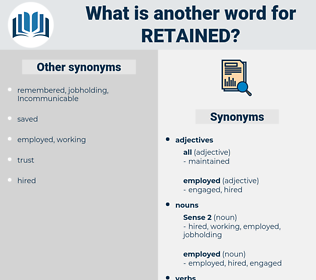 What is another word for retained? winners, TBS, CDS, retaining, retention. restraints, impoundments, Guards, holds, regimes, valves, fences, DUES, blocks. Remained, restrained, sustained, Reiterated, reaffirmed, reservation, retired, maintenance, initiated, repeated, contained, Containing, renewed, removed, Gained, asserted, recruit, Recruited, nominated, designate, designated, recovered, Persisted, Garnered, preferred, restricted, continued, continuing, anticipated, Nurtured, stay, Stayed, Entered, received, Undertook, Adhered, reproduced, Insisted, rejected, Incubated, appointed, keeping, prisoners, Captured, reserved, Contributed, secretaried, Instituted, determined, Operated, hired, encouraged, Rescinded, identified, reflected, collected, Caught, Enacted, established, recommended, accepted, understood, chartered, Remanded, contracted, affirmed, confirmed, Cooperated, saved, Stipulated, considered, Ranged, intended, Attracted, enlisted, stuck, assumed, Envisaged, Enjoyed, left, promulgated, utilized, Contended, Incurred, agreed, Galvanized, Argued, dedicated, absorbed, invited, Resumed, Prevailed, engaged, struck, recorded, endorsed, Upheld, pursued, Relied, provisional, Began, adopted, won, Nope, predicted, Referred, guard, guarding, Filed, concluded, remembered, Performed, enrolled, conducted, Proceeded, trap, Appeared, Embarked, seized, bore, Stood, noted, involved, included, started, Submitted, projected, forecast, supported, Earmarked, occupy, Occupying, accessed, opened, committed, employed, owned, turned, serviced, commissioned, Came, ongoing, used, imposed, opted, promised, decided, expected, Waged, Commenced, drew, Chose, Lived, Belonged, spent, Took, Brought, fulfilled, set, Served, ruled, Followed, pick, Picked, peace-, Borrowed, pledged, Appealed, Claimed, Urged, Lasted, listed, Chaired, Voted, planned, found, Launched, Commanded, Worked, Levied, paid, scheduled, applied, Occurred, manned, Had, sought, Passed, on-call, Echoed, no, booked, Gave, Allowed, Met, let, Acted, HUH, place, called, focused, Got, buttoned, named, made, Non, not, kept. 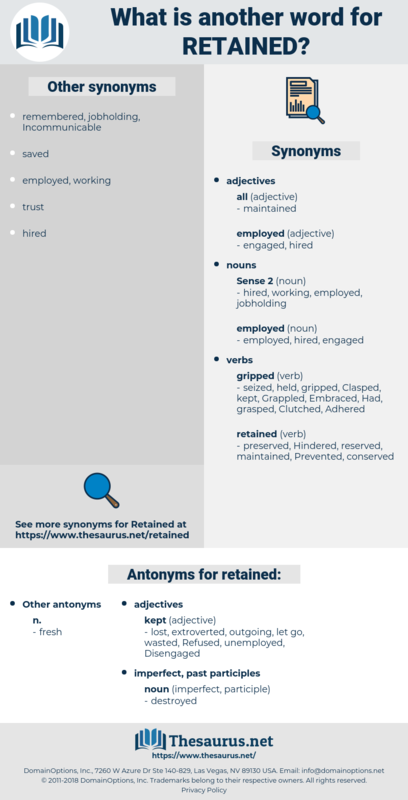 Remained, regained, restrained, guaranteed, ascertained, reservation, incorporated, retired, Incarcerated, maintenance, Retrieved, Eliminated, Replicated, Obtained, initiated, repeated, recaptured, contained, renewed, constrained, Transferred, Perpetuated, Intercepted, removed, Gained, acquired, implemented, asserted, restated, Recruited, nominated, revived, registered, reported, Investigated, substantiated, Assimilated, reprinted, designated, existing, Existed, articulated, recovered, earned, confiscated, demonstrated, arranged, preferred, restricted, continued, safeguarded, restarted, Communicated, Manifested, stay, Stayed, Entered, recommenced, Undertaken, Introduced, apportioned, received, reconvened, entrusted, recognized, Adhered, Managed, accumulated, reproduced, insured, Insisted, transposed, gathered, rejected, invested, acknowledged, Remitted, Enshrined, Accommodated, sequestered, Extracted, Incubated, appointed, monitored, Returned, inscribed, prisoners, treated, cultivated, Captured, apprehended, ensured, forfeited, reserved, Contributed, Instituted, determined, reprofiled, Operated, hired, practised, encouraged, attendance, identified, distributed, reflected, collected, protected, Endured, evaluated, Caught, Defended, Enacted, established, recommended, rescheduled, instructed, Exerted, arrested, accepted, chartered, save, scattered, contracted, respected, Regarded, Reared, confirmed, saved, enforced, Refused, considered, subscribed, finalized, directed, outsourced, Resorted, intended, fastened, Attracted, enlisted, stuck, Amongst, assumed, Achieved, destined, encumbered, Enjoyed, left, unchanged, Encountered, Marketed, promulgated, Rendered, calculated, utilized, assured, addressed, emphasised, deprived, Incurred, lost, agreed, kidnapped, reviewed, Argued, observed, dedicated, stockpiled, granted, measured, Targeted, archived, absorbed, Disbursed, invited, Resumed, fixated, Prevailed, engaged, assigned, tinned, charged, mandated, handled, surrendered, conceded, Cited, treasured, warden, Delivered, admitted, struck, Excluded, recorded, obligated, endorsed, Upheld, Begun, required, raised, Examined, proved, Invoked, pursued, Relied, split, disposed, released, located, pointed, Learnt, recourse, Exercised, verified, expressed, adopted, documented, positioned, compliant, deadlocked, conditioned, presented, imprisoned, affected, allocated, filled, discharged, ratified, confined, guarded, permitted, Embraced, Procured, highlighted, predicted, heated, Referred, possessed, extended, qualified, prohibited, roster, Overhauled, Supplemented, prescribed, Filed, defined, concluded, shortlisted, outlined, Purchased, proceed, remembered, furnished, cultured, Promoted, moved, dismissed, Performed, enrolled, Deleted, conducted, destroyed, enclosed, salvaged, Challenged, Grabbed, trapped, satisfied, Been, Denied, Provided, Equated, Embarked, seized, Carried, Mentioned, elected, Borne, Reached, credited, concerned, wired, honoured, Compiled, Omitted, Assessed, Stood, noted, involved, stranded, included, started, decisions, Cared, frozen, Consulted, projected, suspended, Resulted, occupied, shared, demolished, divided, supported, service, Earmarked, come, Greeted, accessed, expended, opened, designed, committed, contacted, employed, owned, turned, needed, serviced, commissioned, Displayed, framed, bound, changed, drawn, tested, chosen, used, imposed, opted, promised, decided, Commenced, requested, Screened, justified, taken, specified, Sentenced, Lived, Viewed, spent, canned, Brought, drilled, fulfilled, set, taped, Served, covered, Followed, vested, added, Picked, grown, Likened, Obeyed, spoken, Declined, quenched, embodied, pledged, pressed, Appealed, Claimed, Urged, fixed, Lasted, devoted, Taxed, Deployed, listed, become, Propped, Quoted, solicited, Availed, forbidden, embedded, consumed, Deemed, Stalled, Awarded, Discussed, seised, posted, Aimed, Tasked, banned, played, controlled, Ambushed, party, found, Launched, stated, subject, Subjected, Grounded, Worked, cloaked, sampled, Accounted, locked, spread, paid, scheduled, applied, Shown, laid, Occurred, Approached, Favoured, Complied, manned, welcomed, Impounded, Dealt, Had, packed, put, Bought, sought, Passed, heard, handed, Accorded, Counted, Spilled, studied, Supplied, dropped, busted, led, sorted, jammed, Echoed, blocked, given, booked, stocked, loaded, Lodged, Poured, Allowed, Met, let, Housed, HUH, placed, Pooled, funded, gone, Asked, bugged, seen, Meant, sold, called, focused, Gotten, Got, named, shed, done, made, Non, based, kept, retention. lost, extroverted, outgoing, let go, wasted, Refused, unemployed, Disengaged. It should have retained its earliest name of Fort Pepperell. He retained some of them as intimate friends for life. redeemed, red-handed, rationed, ration out, radiant, rotundity, readmit, rhythm method, rhodomontade, redonda, rodomontade, red meat, rotunda, reddened, rodentia, rotund, read method, rhodanthe, rudiment, rodent, ready to hand, rhodonite, ready-made, ritenuto, redound.